My grandparents have a rose garden. They let me take care of it. And I guess I'm turning into a morning person(? ), because lately I love to spend my early mornings in the garden, feeling the sun on my face, clipping the roses, and reading. I'm lucky my grandparents are willing to share something so peaceful and beautiful with me. ooo that sounds fantastic. ummmm bike rides with the hubby definitely do it for me. that sounds lovely. i love sitting outside on a weekend morning, drinking coffee and watching the kids play on the swingset! Perhaps not having a rose garden is part of the reason I am not yet a morning person? That sounds so peaceful, though. 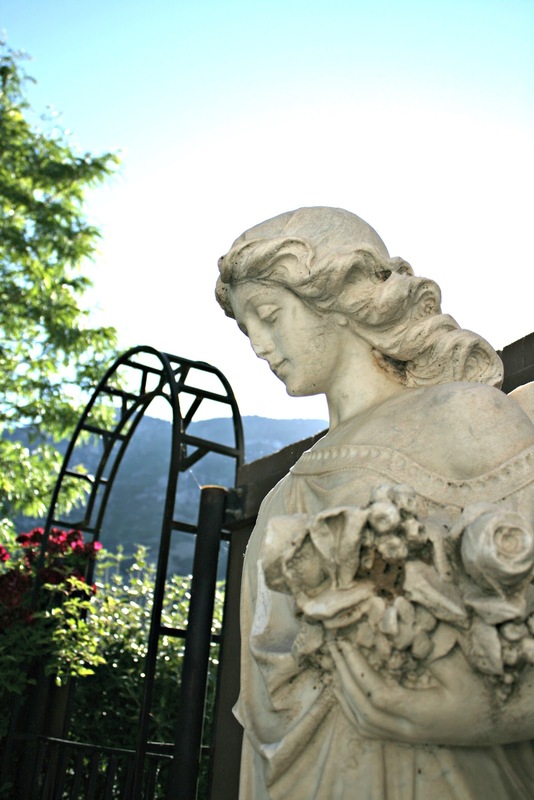 Do you know that statue used to be on my grandmother's grave. Or maybe not her grave, but in her garden. Yikes! I can't remember. Either way, it's special. Guess I better call my mom for some clarification.